These brownies are quick and easy to make. Marie biscuit, condensed milk and coco powder come together to form this simple and delicious sweet. 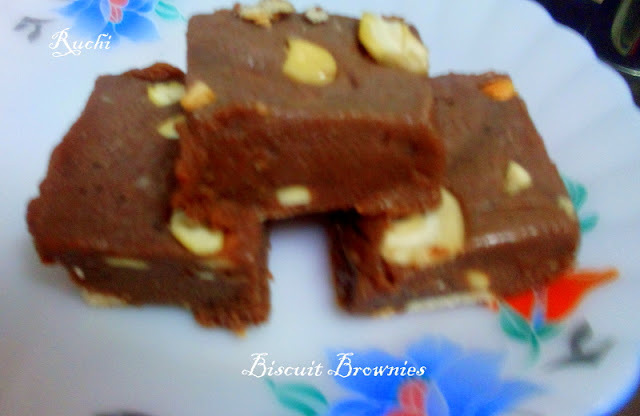 These quick to make brownies would surekids friendly dessert! 2.Melt the butter in a in a saucepan and Heat them till butter gets melted. Then add the condensed milk and stir well. 3.Then add cocoa powder. Mix it well without no lumps. Then add vanilla extract and mix. 4.Roughly chop the roasted nuts and add to the bowl. Mix well. 5.Finally Add the broken biscuit powder and stir until well combined. 7.Line a pan with parchment paper or just grease it & Pour the batter into prepared pan. 8.And cover it with plastic wrap or with lid and keep in the refrigerator to chill for at least 4-5 hours.Once chilled, remove it from the pan and cut into desire size & serve!